Milpitas City Hall is located at 455 East Calaveras Boulevard, Milpitas, CA 95035; phone: 408-586-3000. 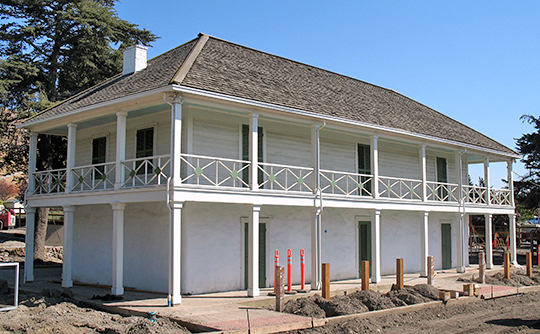 Photo: Jose Maria Alviso Adobe, circa 1837, 92 Piedmont Rd., Milpitas, CA Listed on the National Register of Historic Places in 1997. Photographed by User:Sanfranman59 (own work), 2010, [cc-by-3.0 (creativecommons.org/licenses/by/3.0)], via Wikimedia Commons, accessed October, 2012. The land that is now Milpitas  was in pre-historic time's part of the home territory of the Tamyen tribelet of the Coastanoan Indians; remnants of two notable village sites from the period can be found in the City. Milpitas' present-day origins can be traced to the presence of Spaniards in the South Bay in the latter part of the 18th century. In the mid-19th century, the area was a stopover-point for travelers between Sutter Fort and San Jose. By the late 1850s, a stage line was operating between San Jose and Oakland with stops in Milpitas. In the latter part of the 19th century, Milpitas emerged as a marketing center for farmers widely scattered along the plain and the hills. The Southern Pacific Railroad ran a line from Stockton to San Jose reaching Milpitas in 1869, which led to initiation of new commercial enterprises and consolidation of Milpitas' position as an important shipping point of the rapidly farmanizing valley. In 1920s, construction of the San Jose branch of the Western Pacific Railroad gave the community access to a second rail line. As late as the early 1950s, orchards and farms dotted the Milpitas landscape. In 1953, the Ford Motor Company began constructing an assembly plant south of downtown in a strip between the two railroad tracks; the town was incorporated in the following year. City of Milpitas, General Plan: Introduction and Overview, 2002 update, www.ci.milpitas.ca.gov, accessed November, 2017.